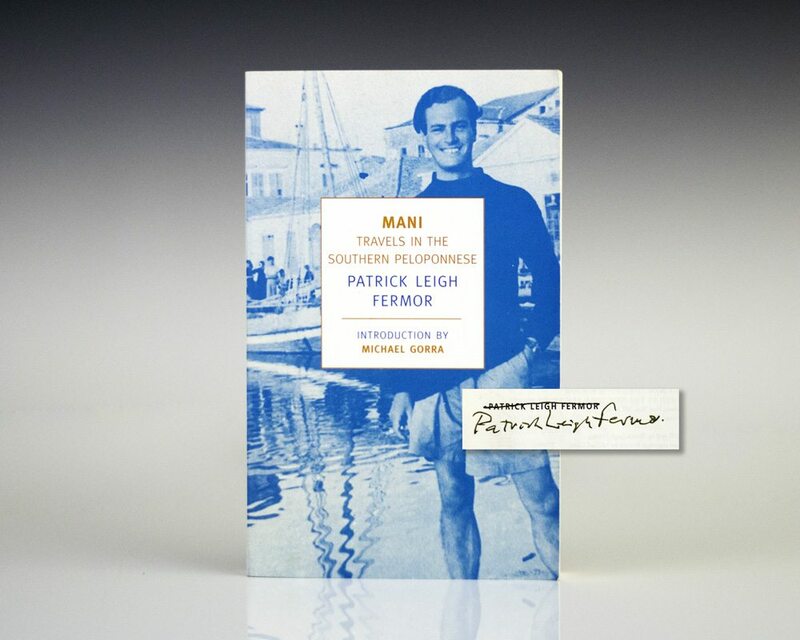 Mani: Travels in the Southern Peloponese. New York: New York Review of Books, 2006. First edition of the New York Review of Books edition. Octavo, original illustrated wrappers as issued, frontispiece by John Craxton. Signed by Patrick Leigh Fermor on the title page. In fine condition. Introduction by Michael Gorra. "His greatest book, Mani, was about a journey through that little-known and, at the time, archaic region. [He] traveled simply, staying with fishermen and farmers, which enabled him to capture the essence of the region.Almost every page has its own literary tour de force, often with intimidating displays of learning and research mixed with fantasy, imagination and acute descriptions of the scene itself" (Robin Hanbury-Tenison, Geographical). "Mani and Roumeli: two of the best travel books of the century" (Financial Times). Roumeli: Travels in Northern Greece. First edition of The New York Times Review of Books edition. Octavo, original wrappers as issued. Signed by Patrick Leigh Fermor on the title page. In fine condition. Introduction by Patricia Storace. Between the Woods and the Water. London: The Folio Society, 2006. First Folio edition of the author’s second book in the author’s trilogy that began with A Time of Gifts. Octavo, original cloth. Signed by Leigh Fermor on the title page. Fine in a fine slipcase. Illustrated by Mary Kuper. A Time To Keep Silence. First edition of the author’s third book, regarding his experiences in various monasteries, inscribed by Leigh Fermor to Deborah of Devonshire. Octavo, original blue cloth. Illustrated by John Craxton. Association copy, inscribed by the author on the dedication page, “For Darling Debo written in great haste! (always) Paddy Leigh Fermor.” Deborah Devonshire began life as the youngest of the legendary Mitford sisters, but she unexpectedly became the duchess of Devonshire when her husband, Andrew Cavendish, inherited the duchy from his brother. Leigh Fermor first met Deborah when she was still a young debutante and eventually formed a deep friendship, as well as a correspondence that would last for more than half a century. Their letters were published in book form in 2010 with the title In Tearing Haste. When something caught their interest and they knew the other would be amused, they sent off a letter—there are glimpses of President Kennedy’s inauguration, weekends at Sandringham, filming with Errol Flynn, the wedding of Prince Charles and Camilla Parker-Bowles, and, above all, life at Chatsworth, the great house that Debo spent much of her life restoring, and of Paddy in the house that he and his wife designed and built on the Mani in Greece. There rarely have been such contrasting styles: Debo—smart, idiosyncratic, and funny—darts from subject to subject, dashing off letters in her breezy, spontaneous style. Paddy, the polygot and widely read virtuoso, replies in the fluent polished manner that has earned him recognition as one of the finest writers in the English language. Near fine in the original dust jacket with a chip to the crown of the spine and tape repair to the back panel. Jacket design by Peter Todd Mitchell. A remarkable association copy. Mani: Travels In The Southern Peloponnese. First edition of the author’s travelogue about the Mani in southern Greece, later complementing it with Roumeli: Travels in Northern Greece. Octavo, original cloth, frontispiece and title-page vignette by Craxton, map of the southern Peloponnese by John Woodcock, and 26 photographs by Joan Eyres Monsell. 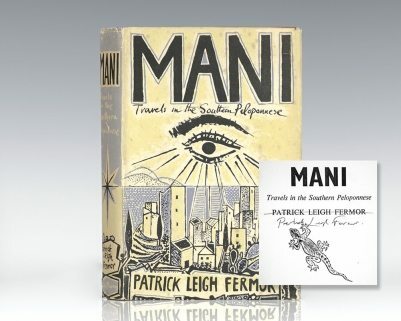 Full page inscription and drawing by Patrick Leigh Fermor on the front free endpaper, “To Mary Anna with love from Paddy.” Leigh Fermor has also drawn the eye mimicking the dust jacket art by close friend and artist John Craxton. He also has written in Greek, translated as “where is Megalexandros p, 187.” Also is a letter in Leigh Fermor’s hand on his stationary to the recipient on the rear endpaper from 1971. The recipient was Mary Anna Marten (with her bookplate to the inside gutter), who was the daughter of the 3rd and last Lord Alington of Crichel and later trustee of The British Museum. An excellent near fine example in a near fine price-clipped dust jacket. Jacket design by John Craxton. A unique copy of this classic work. First edition of the author’s third book, regarding his experiences in various monasteries. Octavo, original blue cloth. Illustrated by John Craxton. Inscribed by the author on the front free endpaper, “Mary Anna with love from Paddy 2.6.88.” The recipient was Mary Anna Marten (with her bookplate to the inside gutter), who was the daughter of the 3rd and last Lord Alington of Crichel and later trustee of The British Museum. Near fine in the original dust jacket with a chip to the crown of the spine and overall wear. Jacket design by Peter Todd Mitchell. 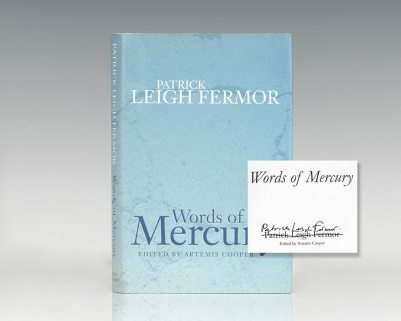 Fermor, Patrick Leigh; Edited by Artemis Cooper. Early printing of this collection of essays by Leigh Fermor. Octavo, original boards. Signed by Leigh Fermor on the title page. Fine in a fine dust jacket. Jacket designed by Octavius Murray. Edited by Artemis Cooper. First edition of the author’s travelogue about the rocky Mani, later complementing it with Roumeli: Travels in Northern Greece. Octavo, original cloth, frontispiece and title-page vignette by John Craxton, map of the southern Peloponnese by John Woodcock, and 26 photographs by Joan Eyres Monsell. Signed by Patrick Leigh Fermor on the title page. Near fine in very good dust jacket. Jacket design by John Craxton. First British edition of the author’s second book in the author’s trilogy that began with “A Time of Gifts”. Octavo, original cloth. Signed by Leigh Fermor on the title page. Fine in a fine price-clipped dust jacket.A very sharp example. Free To Choose: A Personal Statement. New York: Harcourt, Brace, Jovanovich, 1980. First edition of Friedmans’ persuasive argument for the free market, based on the PBS series Free to Choose. Octavo, original half cloth. Inscribed by Milton Friedman and signed by Rose Friedman. Bottom boards rubbed and some scattered foxing to the edges, in a near fine dust jacket. Housed in a custom half morocco box. Rare signed and inscribed.